My new monograph is now available on amazon. 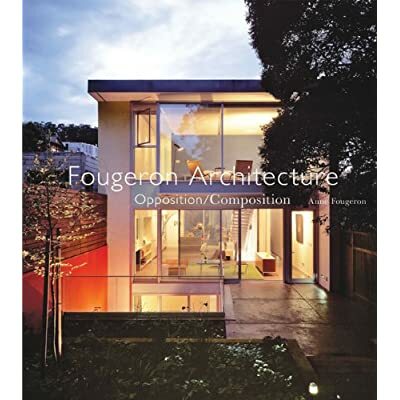 Fougeron Architecture: Opposition/Composition examines the broad range of the architectural practice, including residential, institutional and mixed-use projects. Featuring fourteen projects, illustrated with numerous photographs and drawings, as well as a foreword by Hitoshi Abe, the book presents works that tackle the intersection of conflicting forces: old and new; public and private; rough and refined; urban and natural beauty. This tension animates my architecture, inspiring a humane modernism that investigates cultural oppositions. The aim is not facile harmony of space and structure, but directly engages design with complex social and political questions of the 21st century to fill gaps, heal inequities, and enhance modern life. This critical inquiry relentlessly pushes conventional boundaries of aesthetics and materials. Committed to the political realm, we often use creative experimentation for private clients as the laboratory for public-sector projects, shown in our award-winning clinic, library, and housing projects for Planned Parenthood and the City of San Francisco. In this work, we artfully reconciles design excellence with limited resources, delivering uplifting, cost-effective, and unusual residential and work environments. We have worked very hard putting it all together for you, and I hope you like it! And if you haven’t already, order it now from amazon.com or barnesandnoble.com.